Back in April, just weeks before X-Men: Apocalypse debuted in theaters, a rumor surfaced that claimed 20th Century Fox's next X-Men movie would be a reboot of the Dark Phoenix saga, a story which was told in the last film of the original trilogy, X-Men: The Last Stand. The studio never confirmed or denied that rumor, but today another report claims that this Dark Phoenix story will be the "central focus" of this new X-Men movie. The studio hasn't confirmed this report yet, but given the earlier rumor, it's certainly possible that the studio is considering this story line. Latino Review reports that the movie would center on Sophie Turner's Jean Grey, although the site acknowledges it may be possible that the movie series could be rebooted again, but there's no evidence of that happening yet. The story would follow how Jean's growing power becomes a threat to the entire X-Men team as a whole. 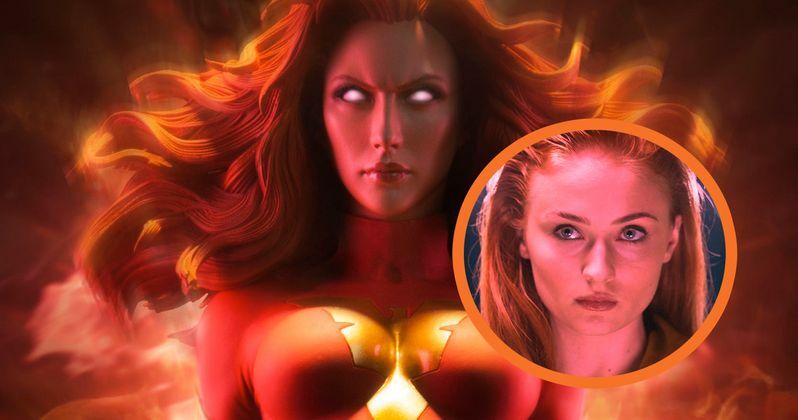 While the Dark Phoenix story was covered in the original X-Men trilogy, the events of X-Men: Days of Future Past essentially wiped out that entire timeline, meaning it would be plausible to bring this story back with Sophie Turner's version of Jean Grey. It's possible this could be a continuation of X-Men: Apocalypse, since the Phoenix Force, long considered to be the most powerful force in the entire Marvel comics universe, was used to help destroy Apocalypse (Oscar Isaac) in X-Men: Apocalypse. Producer Simon Kinberg has already confirmed that the next movie would be set in the 1990s. Director Bryan Singer recently confirmed that X-Men 7 will be at least partially set in outer space, while confirming that the movie will be set in the 1990s. It isn't known if this project he's referring to is the currently untitled X-Men 7, or if it's The New Mutants or another spin-off X-Force, but hopefully we'll get more details soon. It's possible that the cast of the prequel trilogy could actually be split up between all of these movies. While X-Men 7 may certainly center on Jean Grey, and may also bring in James McAvoy as Professor X, other characters from X-Men: Apocalypse and the other prequel movies may move over to The New Mutants. Characters such as Storm (Alexndra Shipp), Cyclops (Tye Sheridan), Nightcrawler (Kodi Smit-McPhee) and Jubilee (Lana Condor) are believed to be featured in The New Mutants, but a full character list has yet to be confirmed. 20th Century Fox hasn't confirmed production details or release dates for either film.